Our checklist of rights and responsibilities for bicyclists and motorists. Read more. 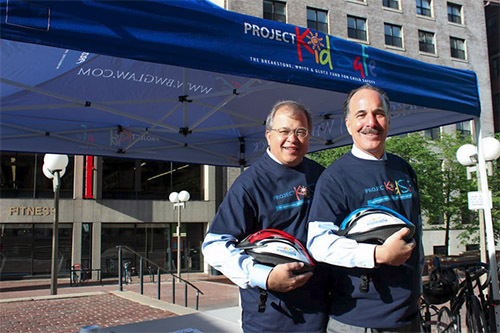 To help protect children and families, Breakstone, White & Gluck donates children’s bicycle helmets through our Project KidSafe campaign. Over four years, we have given away over 10,000 brand-new helmets to children who need one. Along the way, we often meet parents who want their children to be fitted for a helmet but do not have one of their own. This 11-minute video was produced by MassBike, in partnership with the Massachusetts Department of Public Health and the Boston Police Department. The video was developed to provide police officers instruction on the laws for cyclists and motorists. But it is a good resource for any cyclist or driver. Specific topics covered in the video include bicyclists’ right to use the road, dooring, safe passing, yielding to bicyclists on turns, parking in bike lanes, bicyclists’ compliance with rules of the road, hand signals, yielding to pedestrians, lights at night, wrong-way bicycling, and crash investigation. While we hope cyclists are never injured, it can make all the difference in the world to understand how your auto insurance policy works. Many cyclists do not realize this, but you can purchase extra coverage on your auto insurance to protect yourself if you are injured on a bicycle. This is important because there may be times when a driver does not have adequate insurance and you need to rely on your own coverage. Read more. We answer questions about lights, hand signals, parking and more. Read more. 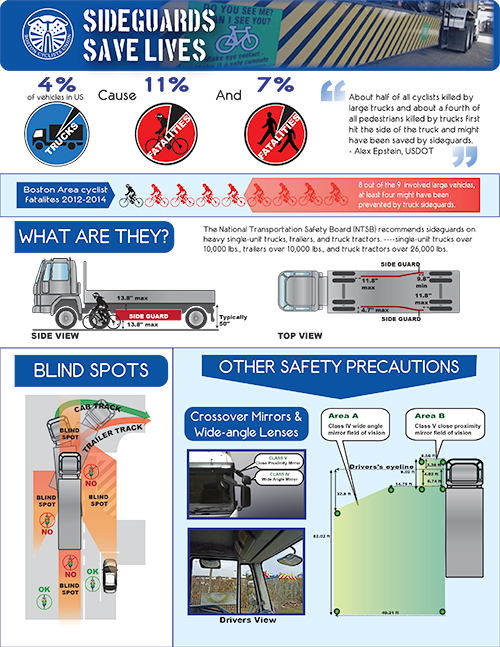 The Boston Cyclists Union has published this sheet to educate cyclists on the dangers they face when approached by some large trucks. Please read the sheet so you understand some of the risks. According to Volpe National Transportation Systems Center, nearly half of all bicyclists and more than one-quarter of pedestrians killed in large truck crashes first impact the side of a truck. When a truck has high clearance, a cyclist can fall in the space between the front and rear wheels. Mandated sideguard on large trucks have reduced cyclist deaths by 61 percent and serious injuries by 13 percent, according to a Transport for London study. In October 2014, the City of Boston passed an ordinance, requiring truck sideguards, convex mirrors, blind spot awareness decals for city contracted trucks and tractor-trailers of a certain weight. Many trucks do not have to comply with the law, but this may change in the future. Legislation has been proposed to require truck sideguards statewide.